Intermec SR30 - Kit (Linear Imager EV12 and RS-232). Requires AC cord, (Part# 1-974028-025). The Intermec SR30 handheld scanner meets the needs of Point-of-Service (POS) applications in retail, health care, office and light industrial settings. Designed to automatically adapt to different interfaces, the SR30 is fast and easy to install, and equally easy to reconfigure. 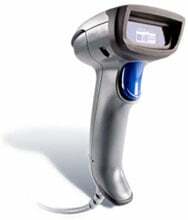 Built for productivity, the lightweight SR30 integrates patented Intermec Vista linear imaging technology to deliver fast, always-accurate scanning even when barcodes are damaged or poorly printed. RS-232 cable for SR30. Requires power supply, not included. Stand, Hands-Free, Compatible with SR30. The Intermec 225-727-002 is also known as Intermec Technologies	INT-SR30AX21	or 225727002	.